Can you believe that it's the last week of July?! Oh my goodness, summer is FLYING! Home inspections went really well, so we're super excited to be progressing toward closing on our house in early August!! Wow . . . better get packing! I'm loving this wreath made from book pages by Tales of a Domestic Goddess! Although, being a book publishing professional, I have to do an inner *gasp* of horror. :o) I still like the wreath, though! 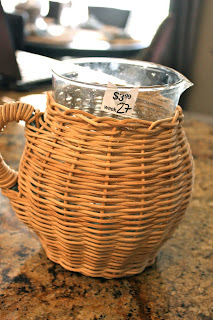 Congrats to Debbie at Love the Decor on such a frugally fabulous find! She found this shelf (originally over $200) for under $60! What a savings! Now, I don't know why the Goodwill's in our area don't do "Dollar Days," but they should! I might just hike on over to "Popcorn Served Daily's" area to do a little shopping. :o) She found a ton of great home decor items and only paid a few buck for it all. Head on over and check out her great finds! 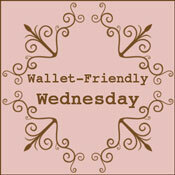 Thank you all for sharing your money-saving tips and tricks in last week's Wallet-Friendly Wednesday.